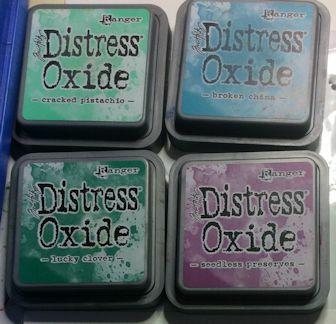 Last weekend Joanna launched some new dies on the Weekender over on C&C.. I made lots of samples for the shows, I will be showing the card samples I made over the next few days. 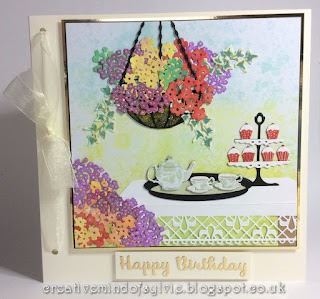 The first lot are featuring the new 'Tea in the Garden' Signature Dies from Joanna Sheen. This shows the 'Flowers for containers' Signature die in the hanging basket along with the Tea for two Signature Die and the Cake Stand die. I die cut the tea for two 3 times so that I could layer the colours up, with the tea pot and cups cut out from pretty paper. 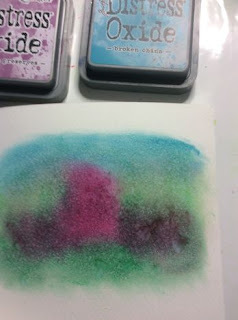 The background is the second 'blot' or print taken from a very bright Distress Oxide background I made. I placed another piece of card over it to take off the excess which wasn't enough so I blotted it again and actually liked that better than the original . I Matt and layered image onto Acetate. 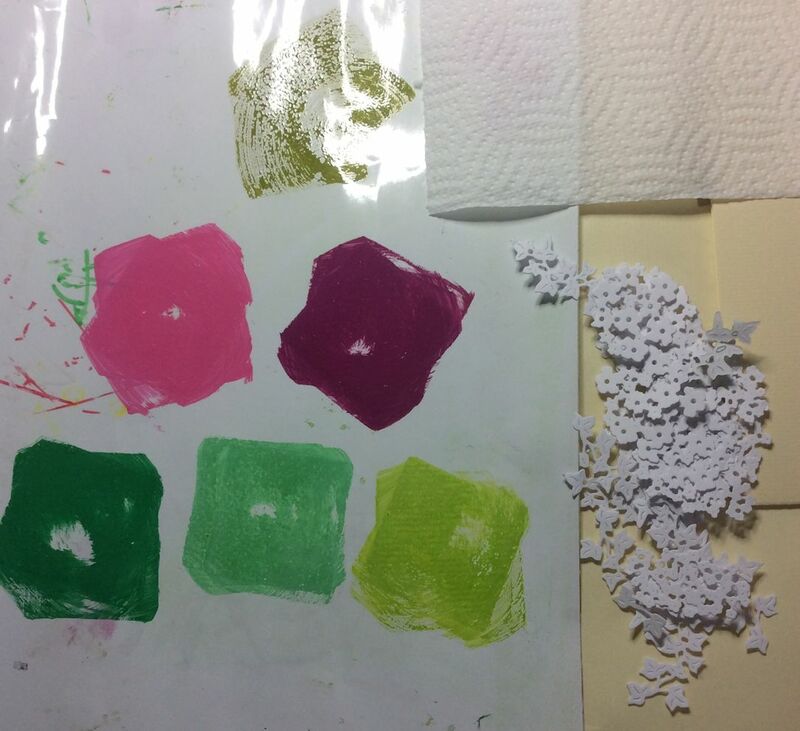 I created the matching background using a sponge applicator with Distress Oxide inks (Peeled paint and Twisted Citron) with a few water splots to take some colour away. 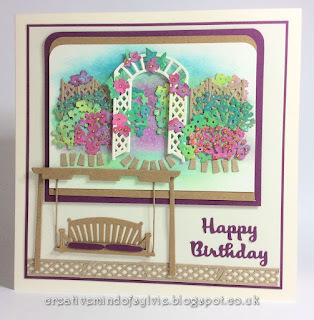 The Watering and Wheelbarrow die cut out of craft card and inked with Antique Linen Distress oxide and sprayed to bring out the colour.. adding pencils when dry. 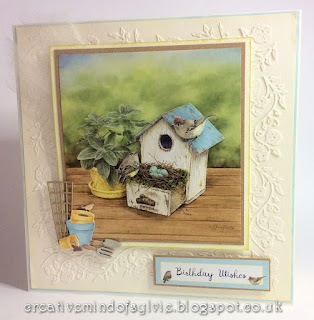 The image on this card is from the other new Jane Shasky card making pad called Birds in the Garden. 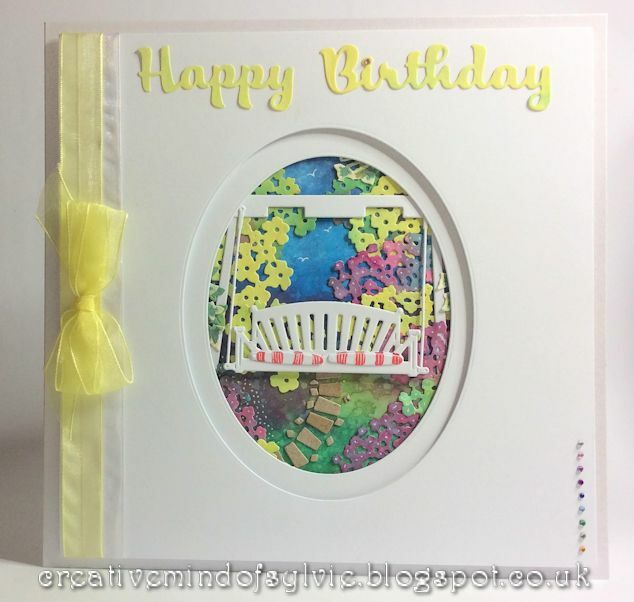 The Garden corner Signature die was coloured to match the image using Distress Oxide inks. 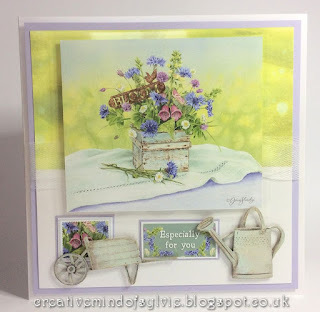 I cut the Morning Glory Signature die multiple times from cream card and arranged around the outside of the image, I think it created a faux embossed look. I added a little piece of tulle to the top left corner behind the image.. I wanted some ribbon somewhere on this card but new it would be too much.. so went for the almost invisible look of tulle.. I think it has added a softness to the card. 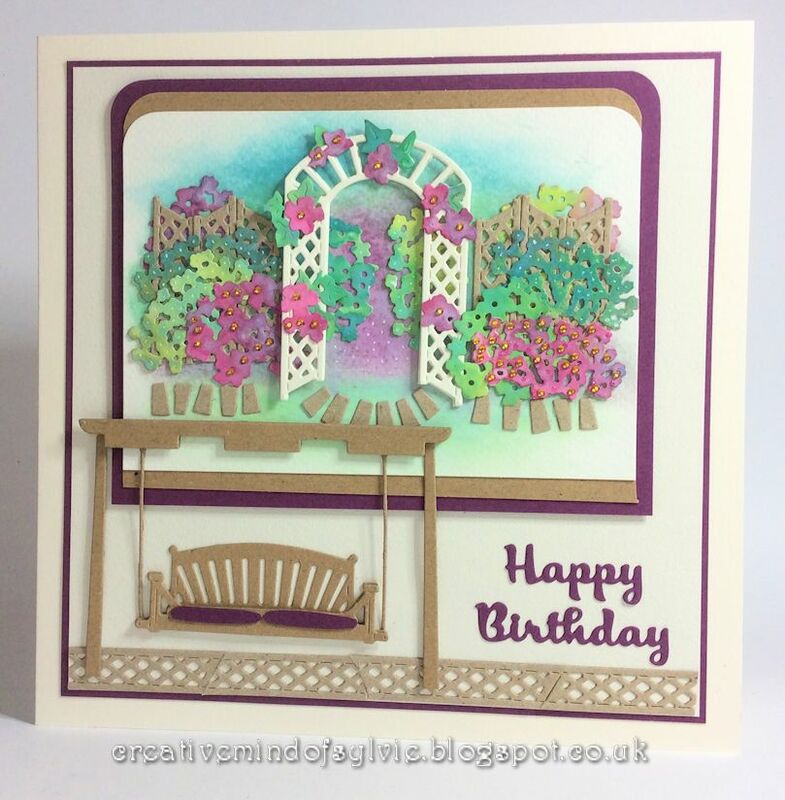 If you look closely you will see that the Trellis Arch Signature die has been repeated each side of the cream coloured one but with Kraft card, I cut off the top part to create the fence panels also using some of the waste to make the stepping stones. The Swing Seat Signature die has been cut 3 times to give a more 3D look once layered up. I inked with a sponge roughly where I wanted an impression of colours and then lightly sprayed it leaving it to dry.. the inks have a wonderful reaction when water is applied. All the flowers for container flowers were die cut and dipped into the inks after adding some sprayed water.. leaving them to dry. I really loved making this card. 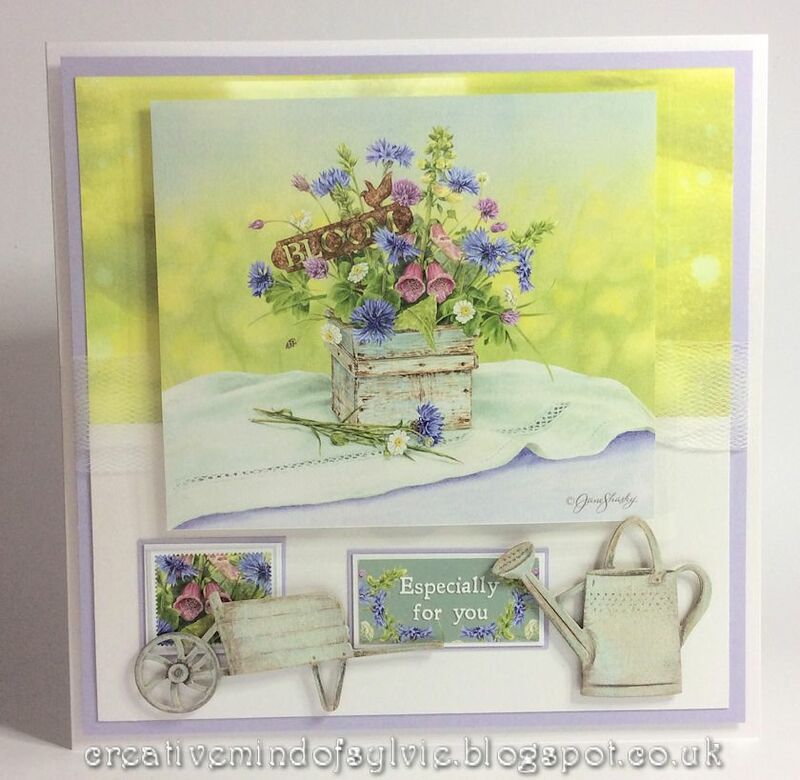 The wonderful Hanging Basket is such a useful die on any card and the new Flowers for container Signature Dies are perfect to fill the basket up! 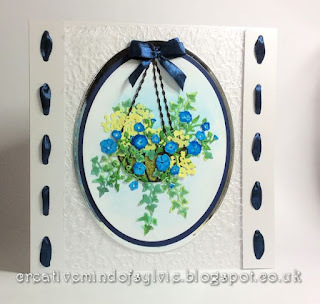 The pretty blue flowers are the Morning Glory vine die that I have coloured in and cut up to add the the basket. If you are interested.. to create a mossy basket I stuck the die onto double sided tape and added green flowersoft. Thanks for visiting today.. come back very soon for the next lot of samples.